We purchased a new car last week, and to break it in, we decided to go for a short drive to Sauvie Island, a small rural island about 10 miles north of Portland. When I suggested Sauvie Island I had an ulterior motive⎯ berry picking! Right now the Hood strawberries are available, and I wanted—no, needed!— to get my hands on those goodies. If you're not familiar with the Hood strawberries, they are the most delicious strawberries ever. So sweet! So juicy! The problem is, once they're picked, they need to be eaten ASAP. They won't last more than a few hours on the countertop before they begin to go soft. It couldn't have been a better day for berry picking. There wasn't a cloud in the sky and the temperature hovered right around 70F. Since it was a weekday, there weren't many people about. And the icing on the cake: the berries were only $1.35 per pound!!! I was so giddy with excitement, I almost peed my pants. (I'm only exaggerating a little.) We picked about 10 pounds, not including the ones we gorged on while picking. It was an enjoyable activity and we'll be doing it again when the blueberries and raspberries are ready. Picking the berries was the easiest part of this whole endeavor. The real work began once we got home. The first order of business was to freeze half of the berries. Frozen berries can go directly from the freezer to the blender for smoothies, shakes and my personal favorites, margaritas and daiquiris. 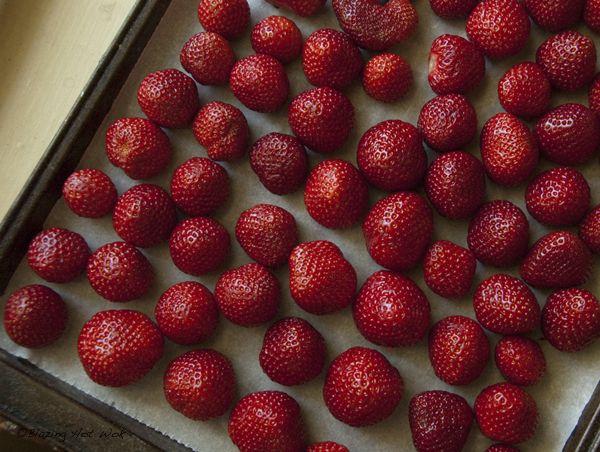 To freeze strawberries: Remove the stems. Gently rinse with cold water to remove dirt, then pat dry. Lay the berries out on a clean sheet pan (I recommend lining with parchment) in a single layer. Stick the whole lot into the freezer, and once frozen, the berries can go in a Ziploc bag for long term storage. Making jam would seem like a natural way to preserve berries, but making a syrup is actually a better way to get the most out of the fruit. Not only are you getting the fruit juices, but the process produces plenty of pulp, which can be used to make jam. It's the ultimate 2-for-1 deal. Pretty nifty, huh? This strawberry syrup is thinner than maple syrup, but the flavor is still quite concentrated. 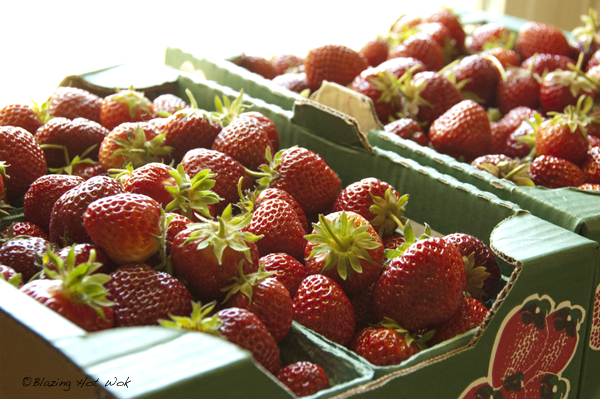 To use, simply dilute with water to taste to make delicious strawberry juice. Using carbonated water will give a nice strawberry soda. Or add a little to lemonade. Throw vodka in the mix and life will be really good. 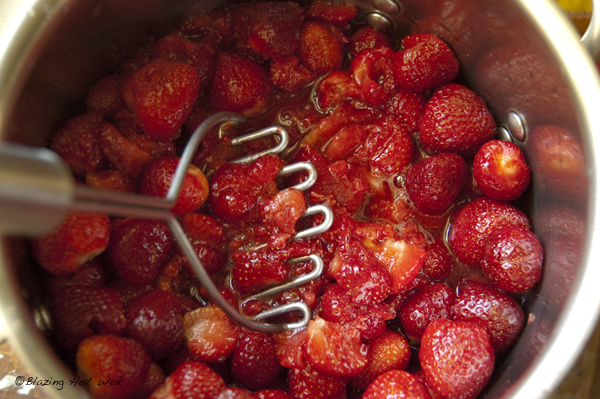 To make and can strawberry syrup: In a large pot, crush about 5 pounds strawberries with about 1/2 to 1 cup water. (This might be easier to do as the strawberries heat up.) Bring to a boil over medium heat then allow to gently boil for about 5 minutes. Stir frequently to prevent sticking or burning. Strain the berries using several layers of cheese cloth set in a strainer or colander set over a large, deep bowl or stainless steel pot. For 5 pounds of berries, I recommend a colander. Most strainers are too small to hold the entire lot, so you'll have to do it in batches, which is just more work. Lesson learned. Let the juice drain from the pulp, undisturbed, for a couple hours. At the end of the straining process, I had about 3 to 4 cups strawberry liquid and about 3 cups pulp. While the strawberries are straining, make a simple syrup using 3 cups sugar and 1 cup water. When the strawberries are done straining, transfer the juice to a stainless steel pot that can hold at least 10 cups of liquid. Add the simple syrup to taste. (I think I ended up using most of it. I also added 2 to 3 tablespoons of lemon juice to round out the flavor.) Bring to a boil, then remove from heat. Transfer the hot strawberry syrup to hot, clean pint or 250 ml jars, leaving 1/2 inch headspace. Wipe the rims with a wet paper towel, center a warm lid on top and screw on bands to fingertip tight. Bring to a boil in a water bath canner and process for 10 minutes. Let the jars sit for 5 minutes before removing from the canner. Allow the jars to sit undisturbed until cooled. I was able to process 3 pints with almost another pint left over. The pulp leftover from making the syrup can also be canned. Since a lot of the liquid had been removed, I didn't bother with pectin. The consistency was thicker than a sauce but not as set as a traditional jam. The taste was still fantastic. 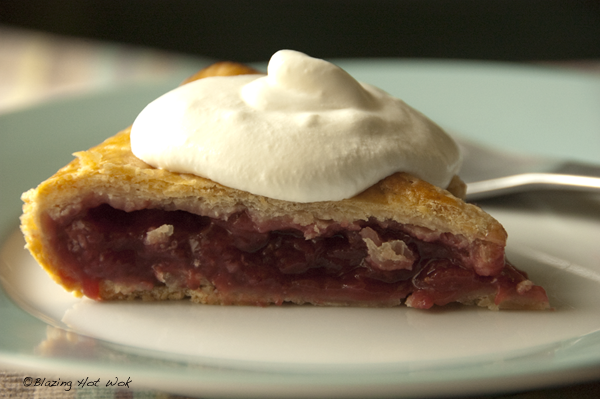 Use it to flavor plain yogurt, make strawberry cream cheese, as a topping for vanilla ice cream or to make a galette (directions follow). Save time and resources by processing the jam with the syrup. 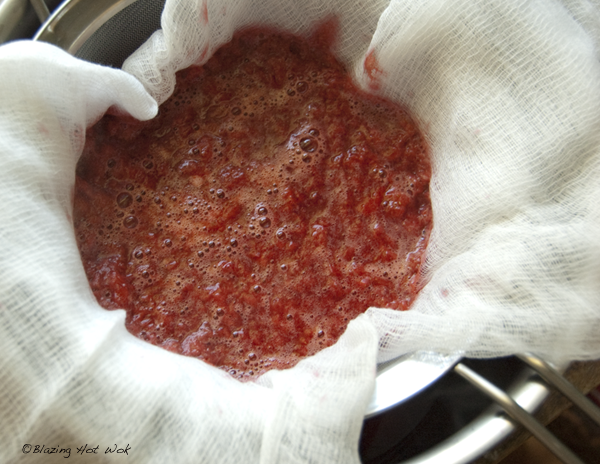 To make jam with drained strawberry pulp: Make a simple syrup with 1. 5 cups sugar and 1/2 cup water. Place the strawberry pulp in a medium saucepan. Add about 2 tbs lemon juice (or more to taste). Add the simple syrup to taste. Heat until boiling then turn down the heat and let it simmer for 5 minutes. Stir frequently to prevent burning. Transfer the jam to hot, clean pint or 250 ml jars, leaving about 3/4 inch of headspace. Wipe the rims and center a warm lid on top. Screw on bands till fingertip tight. Bring to a boil in a water bath canner and process for 10 minutes. Let sit for 5 minutes before removing from the canner. Allow to cool undisturbed. From the pulp I was able to make 2 pints jam. One of the pints didn't sit very long though. I used it to make a delicious galette for Father's Day. 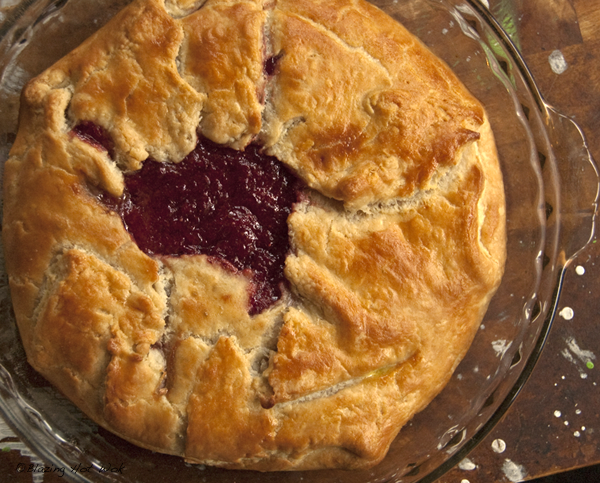 For the crust, I used Smitten Kitchen's hand pie dough, which has a wonderfully buttery flavor and flaky texture. For the filling I used 1 pint of the strawberry jam to which I added about 2 tbs cornstarch mixed with 1 tbs cold apple juice (cold water would be fine). I dotted the filling with 1 tbs butter and brushed the top with eggwash. Into a 375F oven it went and 45 minutes later it came out a nice golden brown. It was tempting to cut into this bad boy right away, but I knew I had to wait for the filling to set. So I placed it out of sight and by tasting time, it had cooled to room temperature and the filling was set. In case you were wondering, it was a big hit. Tell me, how do you like to preserve summer berries?